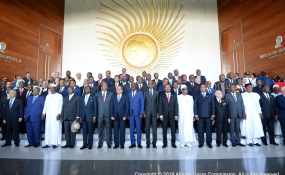 The supreme organ of the African Union (AU), the Assembly, which comprises Heads of State and Government of all the 55 African countries, has begun its 32nd ordinary session. The Assembly meeting is the culmination of the Union's statutory meetings and was preceded by the meetings of the Executive Council and the Permanent Representatives Committee. Among the responsibilities of the Assembly are to determine the AU's policies, establish its priorities, adopt its annual programme and monitor the implementation of its policies and decisions. In this regard, the Heads of State and Government will, over their two day meeting, receive several reports including report on the Outcome of the Leadership In Health Financing Funds High Level Meeting to be presented by President Paul Kagame of Rwanda; President Mamadou Issoufou of Niger will report on the status of the African Continental Free Trade Area (AfCFTA), as well as President Alassane Dramane Ouattara of Cote D'ivoire will report on progress achieved with regard to Agenda 2063. The Chairperson of the African Union Commission Mr. Moussa Faki Mahamat will present reports on the Implementation of the Institutional Reform of the AU and the Annual Report on the activities of the Union and its organs. Other reports will also be presented during the Assembly meeting, to gauge the progress made in the implementation of flagship projects of Africa's Agenda 2063. Regarding the efforts made towards sustainable financing of the Union, President Kagame remarked that, the relaunched Peace Fund now stands at $89 million dollars, with 50 Member States contributing. "This demonstrates the force of our collective resolve and ability", he commented. Today marked the end of Rwanda's chairpersonship of the Union and President Kagame handed over to President Abdul Fattah Al-Sisi of Egypt during the opening ceremony. On his part while speaking at the opening ceremony, the AUC Chairperson Mr. Moussa Faki Mahamat noted that the Commission is excited to build on the continental priorities under Egypt's leadership. The Chairperson noted progress in democratic practices across the continent. He stated that in all elections in Africa, the Commission has endeavoured to provide the necessary support and to ensure the best possible accompaniment to Member States engaged in often difficult electoral processes. The AUC Chairperson expressed his satisfaction with the recent Peace Agreement and peace-building efforts between the Central African Republic's Government and armed groups under the umbrella of the African Union. Talking about the institutional reform of the AU, the Chairperson of the Commission noted steady progress towards financial autonomy and accountability within the Union. "Reform is irreversible", he said. The Assembly was addressed by the UN Secretary General António Guterres who remarked that the AU and UN are working together successfully across the continent, with Africa firmly in the lead, and there was a need to do more to strengthen the partnership. Mr. Guterres further stated that "Africa hosts nearly a third of the world's refugees and internally displaced persons. Despite the continent's own social, economic and security challenges, Africa's governments and people have kept borders, doors and hearts open to millions in need". The Summit is being held under the 2019 theme; "The Year of Refugees, Returnees and Internally Displaced Persons: Towards Durable Solutions to Forced displacement in Africa".